Does your Surrey Hills home or corporate office need a revamp? 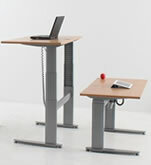 Are you struggling to concentrate on your work because of your uncomfortable office chair or awkwardly placed desk? Adco Office Furniture can help, with stunning furniture packages, clever office fitouts and office furniture for Surrey Hills homes and businesses. Our expert team can design and complete your office fitouts, as well as select office furniture that perfectly meets fits your needs and budget. Office chairs, adjustable desks, whiteboards – we’ve got it all! Those looking for office furniture for their Surrey Hills home or business can choose from a range of packages, styles and products at Adco Office Furniture that can suit any environment. In addition to providing office furniture, Surrey Hills offices can also seek office fitout services from the team at Adco Office Furniture. An office that flows seamlessly and has workstations that facilitate productivity are sure to please your employees and impress your clients. Whether you need reception furniture or a stunning boardroom, we can take care of it all. Adco Office Furniture provide expert advice, personalised service and fair prices. Visit our Burwood showroom or browse our website to see our range, or call us on 03 9808 4404 to talk to our team about your exact needs. If you are new to blogs or if you have been blogging for a while please join us. View our available document downloads, including product brochures. Below you will find a list of our FULL RANGE of Office Furniture Product Categories.